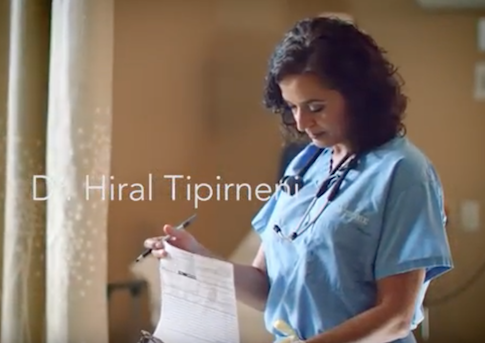 Arizona Democrat Hiral Tipirneni's first ad presents her to voters as an emergency room doctor wearing scrubs with a medical chart and stethoscope in hand, but a new report says Tipirneni hasn't actually treated patients since 2007 when she was the target of a medical malpractice lawsuit. Tipirneni is running in a special election to fill the House seat vacated by Rep. Trent Franks (R., Ariz.), who resigned in December. Her effort to make her career in the emergency room a central part of her campaign was complicated on Tuesday night by local ABC 15, which uncovered a malpractice lawsuit against Tipirneni that came months before she decided to end her career in the emergency room. The lawsuit, according to court documents obtained by ABC 15, said Tipirneni's failed to give a patient a tetanus immunization for a leg wound and the patient ended up in a coma. Tipirneni reached a settlement agreement with the patient. Tipirneni says the lawsuit had nothing to do with her decision, according to ABC 15. The malpractice lawsuit was filed by a Phoenix woman, Belen Carrillo, before her death. Carrillo claimed that Tipirneni and a physicians employee group failed to give her a medically necessary tetanus immunization while treating her for a leg wound in 2001. According to the plaintiff's lawyer and son, Carrillo, then 72, contracted tetanus, ended up in a coma for weeks, and suffered kidney failure. The lawsuit says Carrillo sustained "permanent injury and disability." "I did my best job as I did every time with every patient," Tipirneni said. "Although you feel very bad for any bad outcome and consequences a patient deals with, not every bad outcome is because of a mistake or bad medicine." Tipirneni, 50, says the lawsuit did not cause her to change careers. Tipirneni still has a valid Arizona medical license, though she is no longer certified in emergency medicine. She was not disciplined by the Arizona Medical Board for the malpractice case, according to the report. Tipirneni told ABC 15 that she did not think it was "disingenuous" for her campaign to portray her as an emergency room doctor even though it is not something she has done in a decade. "No," Tipirneni said when asked if the ad's portrayal of her is disingenuous. "That's a skill set I am very proud of, and I worked very hard to acquire." This entry was posted in Politics and tagged 2018 Election, Arizona. Bookmark the permalink.